A few months ago, Dawn and I tagged team a message, and in it we talked about something we called “the circle of Mercy.” it is nothing fancy… in fact, in many ways we made it up. But it comes from the fifth beatitude, in Matthew 5 when Jesus says: Blessed are the merciful, for they will be shown mercy. Mercy is the only beatitude that Jesus gives us, in which the person who gives it receives the SAME thing in return. Jesus is saying “Mercy circles backs on you,” and when we view this from the perspective of our community… of Courage Church… what we have is a circle of people who are actively compassionate toward one another. It becomes the blood flow of our Christian communities. If we have a community who lives by this beatitude, what we have are people who see the world through each others eyes… and in a world like that there is no black and white, there is no rich and poor… there isn’t an “in crowd” or an “out crowd”… at least not amongst us. that is true mercy. That is ACTIVE COMPASSION. cry with people when they are crying. you can’t be actively compassionate… absolutely whole heartedly empathetic toward another human being if you have your own opinion about why they shouldn’t feel the way that they feel. What would show me Jesus right now? What would open the door to the cross in this moment? How do we be Jesus right now? Jesus was ALL about COMPASSION. Compassion sees the world through the eyes of others, and it is stirred to action by what it sees. Character means that We live publicly like we do in private. We write the Word of God on our hearts, practice generosity, and prioritize integrity. Commission means that we are a sending church. We honor the past, while we work for the future. And we always believe that everyone’s brightest days are ahead of them. connection is living a life of constant community with God. He is our supplier, who is as close to us as the air that we breathe. conversation means that we bind and we loose together, we learn together, we serve together, and we grow together. We welcome each other’s perspectives, and we depend on each other’s accountability. collaboration is all of us working together to create something better than any of us could create on our own. Contribution understands that everybody has a role, and there is room for us here. We know that the gifts we are given matter to the body of Christ, and we so seek to discover where we each fit. We honor the contributions of others, knowing that God perfectly crafted each one of us, and only together are we truly the church. Community is a body, committed to all its parts. 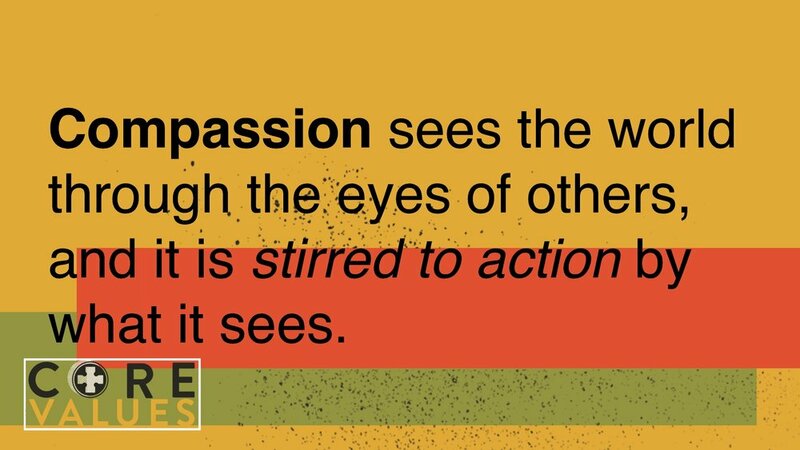 Compassion sees the world through the eyes of others, and it is stirred to action by what it sees. 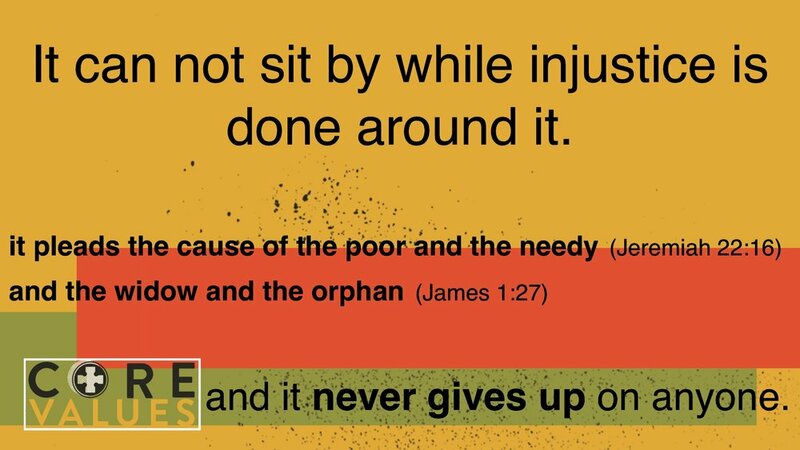 It can not sit by while injustice is done around it. communion is a common union of broken people, who are made whole by the body and blood of Jesus Christ. We are united by our differences, and there is a seat for everyone at the table. if you have no gauge on what is important, then you have no way to measure whether or not you are on the right track. That is what Core Values do… they keep us disciplined… they keep us on mission… they give us something the bounce whatever it is we are doing, off of, and see… IS THIS FURTHERING THE MISSION?